Are you ready for kids to be home for the summer? Would a checklist help to answer the inevitable screen-time conundrum that will happen? Quick! 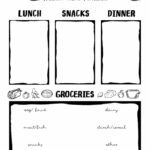 Grab this laminated checklist that will help guide kids through their days by keeping routines and helping around the house, BEFORE they get screen time! A colorful print coated with a super tough 10mm laminate. So you can use washable markers to check things off every day, and wipe clean to start fresh every night!